I recently needed to mill down the thickness of a 7-inch long piece of steel from .25-inches to .20-inches. As the metal became thinner I started getting chatter and a bad finish on the ends because they were not being supported enough by my 3.5-inch wide precision screwless vise and 6-inch parallels. The obvious solution was to clamp the metal directly onto the milling table so its entire length would be fully supported. But that also presented a problem, because even though I had some extra length to work with, it was not enough to keep my clamps out of the way of my fly-cutter, which I wanted to use to get a nice final finish. So, I sought advice from the Mini-Mills Yahoo Group about how to clamp a thin piece of metal to the table without any clamps protruding above it. Many suggested I attach my workpiece to a larger wood or metal base plate using double-sided tape, glue or solder, and then clamp the base plate to the table. That’s what I did, using double-sided carpet tape to attach my work to a nice piece of flat dense particle board. Then, just to be safe, I also used a hot-glue gun to apply a fillet of glue all the way around it. It worked great, until it was time to get the work piece off the board. It was really hard to pry it off the tape. I ended up getting cut and I am lucky I did not bend the metal in the process. I also had to scrub the tape residue off with acetone. I am not giving up on using tape again in the future, but now I am shopping for some that does not hold quite so well. I only used the hot glue gun when I did the flip side and it worked fine. The glue was also hard to remove and the next time I may try softening it a little with a heat gun. Someone also suggested using eccentric clamps to hold the work piece. Unfortunately, I could not find out much about these clamps until I accidentally came across this article (PDF) by Rick Sparber that tells how you can make a set easily and inexpensively. Rick shows a simple way to turn down button-headed hex screws on a lathe so the heads are offset from the threads and will operate like a cam when they are tightened. He then tells you how make some cup washers out of a drill rod with a sharp ridge around the outside. 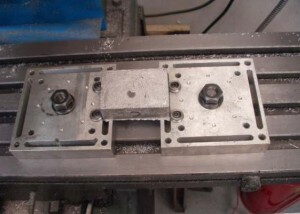 To use them, you take a couple of steel plates that have holes threaded for the eccentric screws and clamp the plates on your milling table so your work piece is held between them. You then tighten the eccentric screws, which forces the cup washers against your work, causing the ridges on the cup washers to dig in and hold your work even tighter. I’m not sure how hard/easy it is to take off tape residue with acetone, but I usually use Goo Gone to break up adhesive residue. Works great for me!